The illusive Lord Mortimer has invited you to his private island. Whilst it seems like the other guests are there for a bit of a knees up, a good old gossip about politics and probably some other more sinister things. Your presence is a little more sombre. You’re investigating how and why your mother went missing on the island just a few days earlier. The Council is an episodic adventure where your actions and choice of words will have ramifications on the outcome of your mission. You’ll be schmoozing with the likes of George Washington and Napoleon Bonaparte in order to find out all you can around the disappearance of your mother, but choose your words wisely as saying the wrong thing can lose you the trust of your fellow ‘party goers’. History, and by history I mean Bill and Ted, suggests that Napoleon had a bit of a temper, so watch out for him! Right from the start The Council sets the tone for the decision making prominent throughout the game, it also paints a great picture of the time period with some lush looking visuals in places, with everything feeling very grand and opulent – as you’d imagine being amongst such esteemed guests. 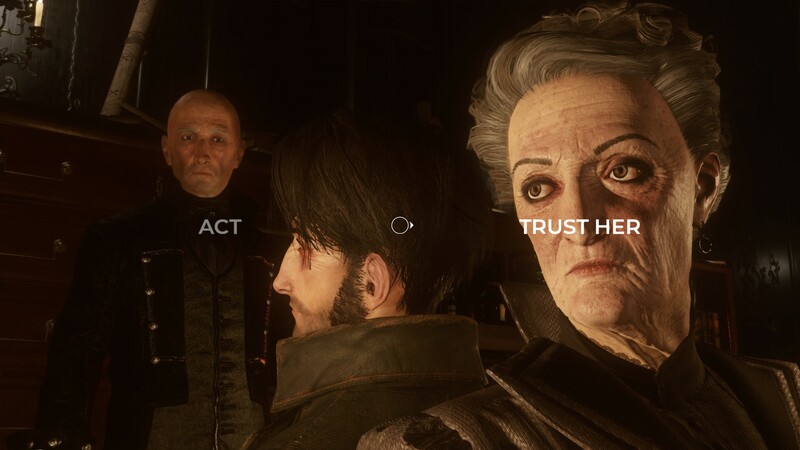 Decision time, do you trust your Mother? The Council tries to change the format for how you act and react in those crucial moments where your words hold weight. You have your standard “take one of two paths” options, but there is also a system used where you get a few chances to convince the person you’re talking with to reveal what you want to know. Essentially you’ll have to ‘pass’ a number of dialogue checks, but you have certain amount of times you can fail. It’s a nice approach and I like that you can make multiple attempts, but the dialogue for it at times seems a little off. In one moment you can really offend someone by saying the wrong thing and they may seem totally outraged, but in the very next moment they’re back to their neutral state and you can work your magic on them. It’s a little jarring and kind of takes you out of the drama for a moment. The more you get to know people the more you’ll understand them though, and you may be able to exploit someones personality as they all have their own vulnerabilities and immunity to certain topics or approaches. 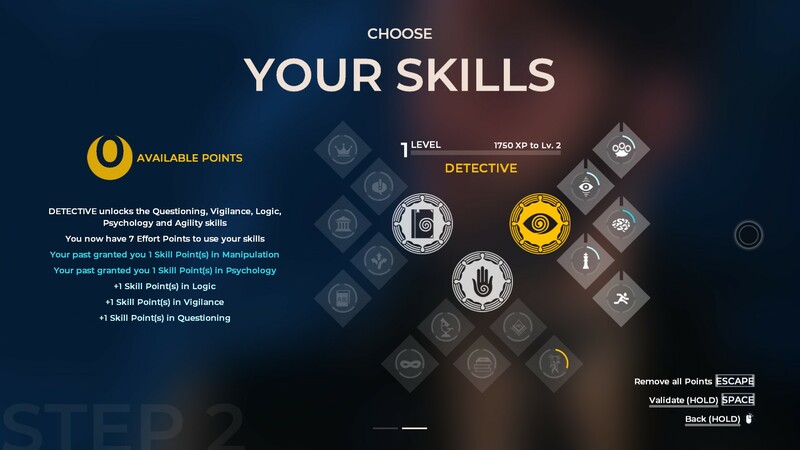 To help you with your investigation there are also some light RPG style elements where you can gain experience from completing certain mini objectives during scenes, you then get to spend that experience on perks. There are three distinct paths for perks and each path has a set number of perks you can acquire and upgrade. You may want to learn to be sneaky and pick locks, or you may want to learn about art and history so you can impress the guests with your wealth of knowledge when joining in in conversations. During conversation there will be little moments where you can interact with the scene – noticing a piece of jewellery that someone is wearing, or picking up on certain body language. Depending on the skills you’ve unlocked will depend on what you will notice, and if you do, you may gain some valuable knowledge about a person that you can use later to your advantage i.e. someone may be susceptible to intimidation. Honestly, there is quite a lot going on with the mechanics and it can be a little overwhelming at first trying to learn and understand it all, all whilst trying to get engaged with the story. As The Council is episodic, expect cliff hangers, expect a lot of un-answered questions and expect it to be fairly short at around 2-3 hours for the first part. You can probably drag that time out a bit by searching ever nook and cranny for information and you might find something useful. I didn’t rush through, I also didn’t search everything and I don’t think I ever felt like I’d missed anything. Obviously I missed certain paths with conversations with my choices, but that can’t be helped. I did feel like some of the decisions were a little cheap. With one specific one standing out in my mind. I knew that as soon as I’d made my decision, it would come back to bite me and almost immediately it did. I don’t mind that, but in this case it just felt like a cheap move and there was no real reason for the way it played out – I realise this is very vague, but I don’t want to spoil it. For me the most important elements for games like this is whether it makes me want to play more, whether I want to know the answers to the mysteries and thankfully The Council does make me want to play more. The story is good and filled with a wide variety interesting and unique characters. There’s lots of mystery around Lord Mortimer, the island and why everyone is there and I want to know it all. 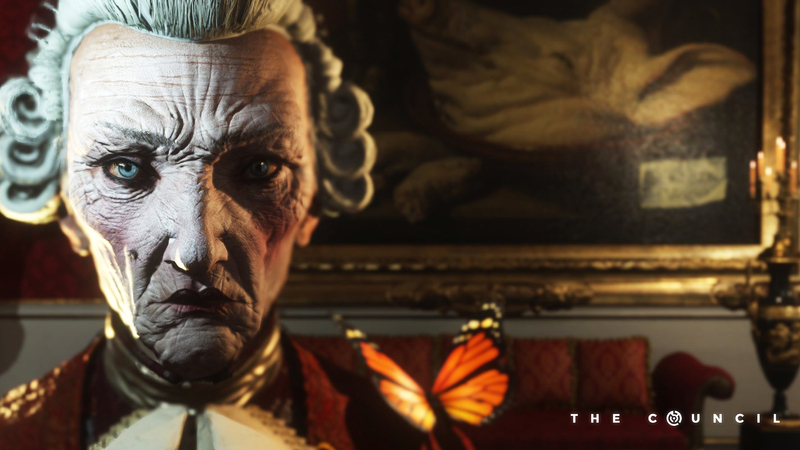 The Council Episode 1: The Mad Ones is out now on PC, Xbox One and PS4 and is a good opening to the series, with good visuals, a compelling story, generally good voice acting and a great setting; let’s hope that the rest can keep up! Thanks for this. I’m quite interested in giving this a go, but I think I’ll wait for the full thing to be released as I’m super impatient and don’t like waiting for future episodes. I know what you mean, especially when the episodes can be so short. I really enjoyed the first episode, looking forward to the next one releasing! Yea it was good! Interested to see how it all unfolds.